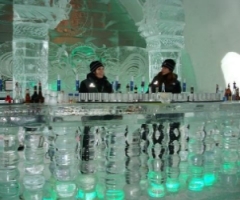 The H�tel de Glace or the Ice Hotel gets more spectacular every year. They offer a visit, an event, and even a night stay in this cathedral-like hotel made from the purest of all natural resources, namely water, guarantee the most surreal experiences. Its immense halls adorned with beautiful artwork emerging from its walls of snow will amaze you. 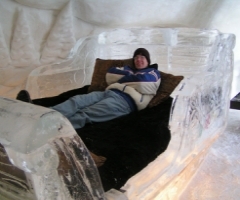 You will see exquisite furniture created from sheer ice and unique ice candelabras hanging from its 18 foot ceilings. The Ice Hotel opens its crystalline halls for its guests and visitors yearly in early January only to be fated to disappear in early April as it slowly melts away under the warm spring sun. The inspiration for this unique tourist attraction comes from the small Swedish village of Jukkasjärvi where an Ice Hotel has been welcoming guests every winter for more than ten years. Each year, thousands of visitors from around the world travel to admire this architectural achievement. Its beauty, size, and the quality of its design and artwork, carved out of snow and ice, are simply astonishing. Now North America can experience its own dazzling version of this winter tourist complex right. The incomparable Ice Hotel is well on its way to becoming the subject of Quebec’s, Canada’s, and North America’s most outstanding winter postcard. With each passing year it has assumed the role of an exceptional tourism product for international markets, attracting an increasing number of tourists for the region, province, and the country. Since its conception, this project has benefited from constant high-level support from the Government of Quebec. The Soci�t� des �tablissements de plein air du Qu�bec (S�paq) has wholeheartedly supported the project by contributing the wonderful site know as the Station �cotouristique Duchesnay. Local support, through the efforts of the Tourism and Convention Bureau of the Quebec, was also instrumental in helping the dream become reality. After five years of dedication, partners Jacques Desbois and Yvon Gu�rard are geared to launch operations for upcoming season.